In the morning between 8.00 and 8.25am, the children are brought by their parents to the meeting point on the edge of the forest. There, they are met by a group leader and two interns or trainees. All children are dressed according to the ‘onion principle’, i.e. in multiple layers for warmth. Each child carries his own rucksack, containing his mid-morning snack, or‚ Znüni-Box’ and a thermos flask of warm tea. The day begins with the morning circle; the carers greet everyone and the children are counted together. A location for the day’s adventure is chosen, and then the group can set off. They take with them their handcart containing the materials for the day: a can of fresh water, cooking utensils, a tarpaulin, a large blanket, mats to sit on, a toolbox, the day’s lunch, a mobile phone for emergencies and a first-aid kit. At around 10 am the group arrives at the chosen location. The children sit down together and eat their snacks. Then it’s time to play! The children look around to see what the environment has to offer. A fallen tree becomes a ship or grocery shop, and the upturned roots a giant forest monster. The children discover animals, stroke the soft moss or the prickly needles of a fir branch, jump around in fallen leaves or go sliding on their trouser bottoms down a muddy slope. 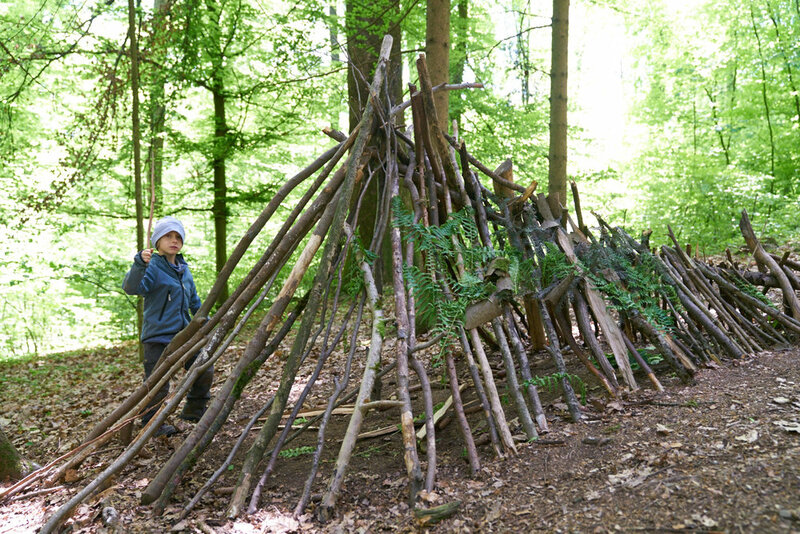 The woodland materials available encourage imaginative games with leaves, branches, stones, beech nuts, acorns, pine cones, mud, snail shells and so much more. The carers offer assistance where needed and are there whenever required, but remain a background influence, encouraging the children to be independent and act and think for themselves. The child who brought lunch for the day can now help gather wood and light the fire. Lunch is warmed on the open fire and eaten together, sitting on mats in a circle. Troll lunch is vegetarian, although families are welcome to add meat as a child’s mid-morning snack. The families cook in turn and each brings lunch for the whole group on the morning of their turn (usually once a month). Smaller children can snuggle down for a nap on thermal mats and sheepskin rugs, wrapped up warm in a woolen blanket. The hammock also provides a much-loved spot for a nap in the open air. After lunch, there is time left for free play before the group gathers again for a final circle, says goodbye and sings a last song or plays a last game for the day. Then it’s off again down the path to the meeting point, where the parents await their children, rosy-cheeked, dirty and happy.